Here are a few photos of standing up the bridge trusses. We're making plans for a snow day at the railway on Saturday, February 17. Board the train at Sheepscot station between 10am and 2pm and we'll bring you to our 20+ acre field and forest at the Top of the Mountain. Bring your snowshoes, backcountry skis, or winter hiking gear and enjoy the Maine outdoors. Or, we'll be cutting trees and burning brush along our "Mountain Extension" – new volunteers are most welcome, and the bonfires will be sure to keep you warm. Check out our Facebook Events Page for more details. Train fare will be $5.00 per person. For those who have never attended an event hosted by the WW&F, it is a true step back in time. With very little modern day items to see along the way, it is easy to feel like you are back in 1918. 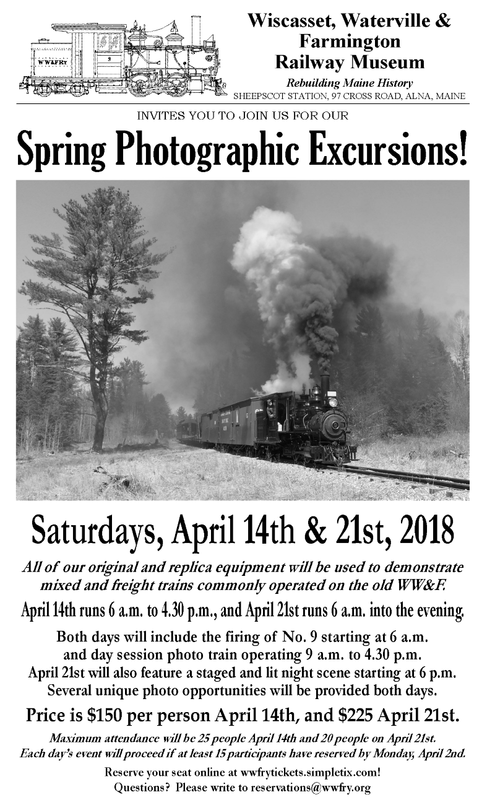 In addition to these excursions, if enough interest can be generated, we can organize a tour of the future track project, including bridge site, tour of what once was at the Upper Wiscasset yard, and any other points of interest. The tour would be held either Sunday or Monday on April 22nd or 23rd. Also note the railroad will be under repair the week after the event, and participants are welcome to visit to see the work going on any time during the week. Also, the weekend of April 27th through the 29th is our annual Spring work weekend, and we plan to run steam for at least two of those days, as well as rebuild a section of track about a half mile from the main station area. The section we are rebuilding will be torn up Saturday afternoon after the photo train clears. For either weekend, although one day is advertised, visitors are welcome to visit and or participate anytime during the week from April 23rd through April 29th. Thank you for your interest and support in the WW&F. Price for April 14th is $150, and April 21st is $225 and includes a night photo session. Trains will leave Sheepscot around 9a.m. both days, and photographers are invited to arrive as early as they would like to capture early morning light as the engine is fired up. That's right, we'll be ripping up the railroad! Don't worry, we'll be putting it back down the following weekend, with a new subgrade and ties though a particularly poor section of our row. 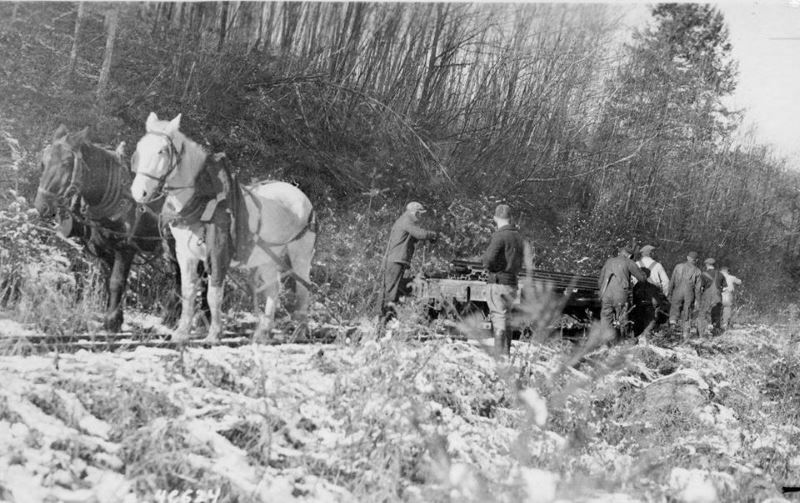 Of course, we also need volunteers for the Spring Work Weekend (4/27-4/29) to lay the track back again. We had one "walk up" customer for last weekend's photo excursion; please join us! Here is a video made by one of our guests this past Saturday. This weekend will include a mixed train and a rare scrap train, as well as a team of horses pulling a car for a few scenes. Great video. Definitely want to take a trip on the WW&F! Not many places where photographers can ride a train and not have to worry about photo shopping out modern things, such as power lines, etc. Our volunteers try very hard to get as close to period dressed as possible. Some photos of a work extra this past Saturday ditching and picking up bad ties. Meanwhile, this week work is continuing on the bridge itself. Its covered "boxed" sheathing is being installed – giving the bridge its unique style.It is one of only six remaining boxed pony truss bridges remaining in existence. Saved by the National Society for the Preservation of Covered Bridges, then gifted to the Museum, it is slated to be installed later this year at Trout Brook, with the rails extended "down the mountain" to reach it shortly thereafter. That said, support is still needed to complete the funding for the bridge's placement/installation, and the "mountain extension" as a whole. This is excellent, and will put us that much closer to having rails to the bridge by Columbus Day of 2019 if all goes well. #9 is running every weekend from now till the end of September depending on crew availability. Come on by to check out the covered truss bridge in the parking lot, learn how a steam engine works, see or help turn the 18 ton engine on the turntable, take a trip back in time to yesteryear, and much more. Come visit Maine's only steam locomotive operating on home rails. We have a herd of people going up in two weeks. We've turned Fathers Day into a Visit A Railroad Day. Last year the SR&RL, this year the WW&F, next year probably the B&ML. Thank God New England has a plethora of railroads. Last edited by eustis22 on Thu May 31, 2018 8:57 pm, edited 2 times in total. Thats awesome. Fathers day weekend is next weekend, however the WW&F is hosting a special Town of Alna day, where special trains will be run, Alna residents will be able to ride for free, and we will demonstrate why the railroad was important back in the day, and why it is important today. As for this coming weekend, June 2 & 3, I will be around on Saturday. Weather forecast looks great for both days, and as mentioned, our volunteers love to share knowledge, and history.